I guess I'm on a music kick this week! Today is all about writing music. I wanted to share some of my favorite soundtracks for writing and get some soundtrack suggestions from you! 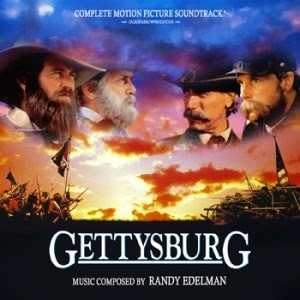 While writing It Took a War I listened to the Gettysburg soundtrack and made separate playlists on youtube for different emotions such as calm/sad (Men of Honor, Reunion and Final), suspense/battle (Armistead is Hit, Battle of Little Round Top), and patriotic (Fife and Drum, Main Title). Gahhh this soundtrack is amazing!! Also, the movie is SO GOOD. For Ain't We Got Fun, I didn't listen to a soundtrack until more toward the final letters. I listened to Miss Potter, and one of my favorites songs from it – When You Taught Me How to Dance. I seem to listen to Miss Potter for quite a few of my projects. It just love it! For my current WIP I've been listening to instrumentals by Helen Jane Long, Schindler's List, and Sophie Scholl: The Final Days soundtrack. But mostly Schindler's List. I haven't seen the movie yet so the music doesn't bring any unwelcome images into my head...I hear the movie is intense. Ahh the music gives me chills! Also, it reminds me of the Olympics when that teenager from Russia did that amazing ice skating thingy. Yeah, I know all the technical terms. A few other soundtracks I enjoy are War Horse, Gods and Generals, and instrumentals by Brian Crain. Oh! And I just had an epiphany! I really should write while listening to the soundtrack of one of my all time favorite movies...Emma (2009). My playlists are ever growing! What about you? Do you listen to music while writing? What soundtracks do you enjoy? So many of those soundtracks are favorites of mine! Miss Potter is one of my all-time favorites. I liking these music-themed posts of yours, Emily! Oooh thanks so much for the recommendations, Hannah! I'll be sure to check those out! I rarely listen to music while writing—I prefer to concentrate on one or the other. But I listen to a lot while daydreaming up scenes, and soundtracks are the best! That and some of my favorite classical pieces. I agree...soundtracks are the best for daydreaming up scenes! Yes, the Gettysburg soundtrack is rather bittersweet, but really good for writing a war book! =) Thanks for commenting! Love your music writing choices!!! I also really like How to Train Your Dragon 2, Braveheart, and the music from Game of Thrones ( though I would NEVER watch it - the music is just perfect for emotional scenes) and the Book Thief soundtrack as well. Oh, are you writing a WWII novel?! =) I'll have to listen to the Pearl Harbor soundtrack! Thanks for your other music recommendations as well! I am actually and I'm very excited about it though being published is a long way off! :). I'm sure you know what that's like. Aww yay :). Thank you!! Oh, I'll have to check out that soundtrack! Thanks! Oh this is so neat! Just today I got a cd of old west music that I'll be listening to for a project of mine! That's awesome, Mary!! Thanks for commenting! I enjoy listening to traditional Irish (and some Scottish) music and classical music. This is superb! erm.. I listen to mainly musical music then musical songs the instrumental versions haha.. Oh Em by the way.. you have me ADDICTED to teh Newsies soundtrack!